CTMQ > Curiosities > Superlatives > The Oldes Theme ark in the U.S.
September in Connecticut is not usually a month for cavorting at a waterpark. However, with 2007 the way it is, we were treated to a nice warm late summer day to check out the oldest themepark in the country: Lake Compounce in Bristol. For those of you not from CT, you surely think of ESPN when you hear mention of Bristol. For those of you from these parts, Bristol is not usually associated with family-friendly fun. But there it is, tucked nicely along a hill and away from the more urban areas associated with Bristol; a sprawling old family owned themepark! 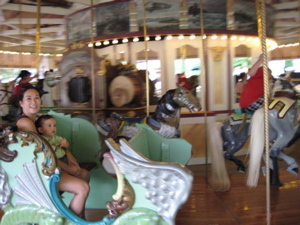 I’ve had difficulty deciding how I’d categorize Lake Compounce – is it a museum or a curiosity? I settled on the latter, but it could be a museum. How? Well, for starters, I would think being the oldest continuously operated theme park in the country qualifies. Regardless, that would be sort of a stretch. I had free tickets from a ride-sharing program and we decided to go with no forethought. We packed up Damian’s stuff and headed west. The vast parking lot is dirty and dusty, but why waste money on such extravagances? We trekked in through the main gate and surveyed the scene… Ahhh, Americana at it’s best (worst?) Carnival barkers stealing dollars from gullible people, Giant overstuffed baked potato stands, weird tchotchkes for sale… we scurried past all that stuff and headed straight for the waterpark. It was crowded, of course, but big enough to handle it. It appeared clean and offered a lot of fun options. Damian LOVES water, so he was in his element. 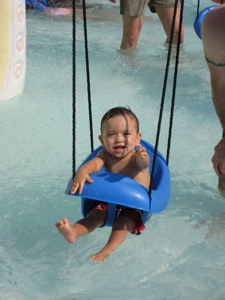 We walked around the wading pool with all the other little kids, but he wanted some ADVENTURE! So we went up and down and all around – short kiddie slides and sprouting waterfalls. There are a couple long barrel slides for the older set but I never got the chance. There’s even a lake and beach to lounge about on – not your typical theme park at all. A huge pirate ship offered a focal point and everyone seemed to be having a great time. On October 6, 1846, Samuel Botsford, an influential Bristol scientist, persuaded property owner Gad Norton, an original settler descendant, to let him conduct “a series of beautiful experiments in electricity.” Well publicized, the event drew thousands of spectators who witnessed the demonstration amidst the beauty of the woods and water. Although the final experiment of “blowing up from shore, two huge jugs of gunpowder tied under a raft in the middle of the lake” failed, it did inspire Mr. Norton to action. He put a path around the lake, set up picnic tables, allowed public swimming and rowing on the lake and built a gazebo for lakeside band concerts. 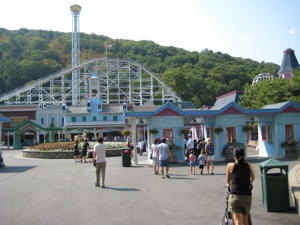 Lake Compounce had officially opened to the public as a picturesque “picnic” park. In 1847, the “Southern method” of cooking lamb was introduced by Lake Compounce to families, groups and organizations and the long and profitable tradition of summer barbecues began. The following year, a hand-powered revolving swing and Connecticut’s first ten-pin bowling alley with adjoining pool tables became new attractions. In 1851, Isaac Pierce, a successful “California Gold Rush 49er,” joined forces with Norton and the firm of Pierce and Norton was established. 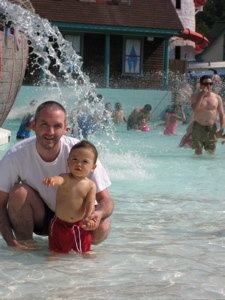 That’s enough of that for now… We left the waterpark and Damian decided he’d take a quick nap. I don’t know how, what with all the excitement surrounding him. In truth, there are only a few rides worth riding for guys in their 30’s like me. 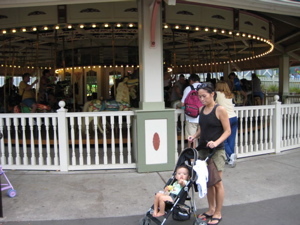 But we walked through the “Kiddie area” that was still a couple years off for Damian. How shall I put this – it was pretty lame. The rides were sort of beat up and rather old looking. In 1875, Norton and Pierce petitioned local legislators that their residences be “set off” from the town of Southington to the town of Bristol. A sheep roast was held in appreciation to those legislators and friends who helped secure the granting of that petition. In this quiet manner, the famed “Crocodile Club” was established and, in 2000, celebrated its 126th reunion. The Casino, the first permanent building on the property, was built in 1895 with a restaurant downstairs and a ballroom upstairs. A full course dinner cost fifty cents. Public transportation also began that year as the Bristol and Plainville Tramway Company and later, the Southington and Compounce Line, brought thousands of park goers to Lake Compounce by trolley. 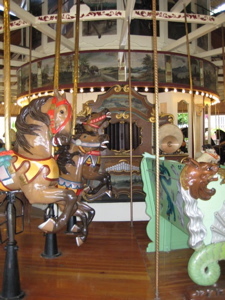 Around that time, Timothy Murphy of Savin Rock, Connecticut, began to assemble the Carousel. Combining the works of four master carvers and a Looff mechanism, Lake Compounce purchased it for $10,000 and it opened to the public on Memorial Day, 1911. 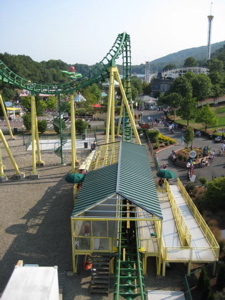 In 1914, the Green Dragon, Lake Compounce’s first electric powered roller coaster opened to the public. It was replaced by the “Wildcat,” a wooden classic built in 1927 by the Philadelphia Toboggan Company. 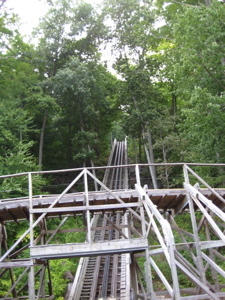 The “Wildcat” operates to this day, and in fact, was recently designated as the best amusement park ride by readers of Connecticut Magazine. The Wildcat was closed when I was there, sadly. But looking at it, I’m not sure I’d feel comfortable on it. 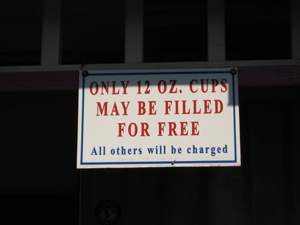 I also didn’t feel comfortable on the Zoomerang but that was the next order of the day. Hoang and Damian watched as I boarded the looping steel coaster. The seats are brutal – the safety bar crushed my clavicles and sternum. I sat next to some old guy who was as nonplussed as I was, so that was pretty funny in a way. Up, up, up… then down, loop! Around, up, down, loop! Up, up, up… and now we were backwards through the whole ride again. Cool concept, but too short and the seats were really just too uncomfortable. Everyone complained of some sort of pain while disembarking. I met up with the family and we enjoyed the musical stylings of the The Three Cylinders – “Mechanics by day, Doo Wop wannabes by night. These greasers spend their afternoons fixing up their vintage cars and dreaming about hitting the road on tour. You’ll want to race to Zoomers Gas ‘n Go to catch this trio of harmonies and humor.” Ahh, brochure writing is always so entertaining. Zoomer’s Gas ‘n Go is little Corvettes for kids to race around in. But the Three Cylinders are where it’s at. I figure they are college theater interns or something. 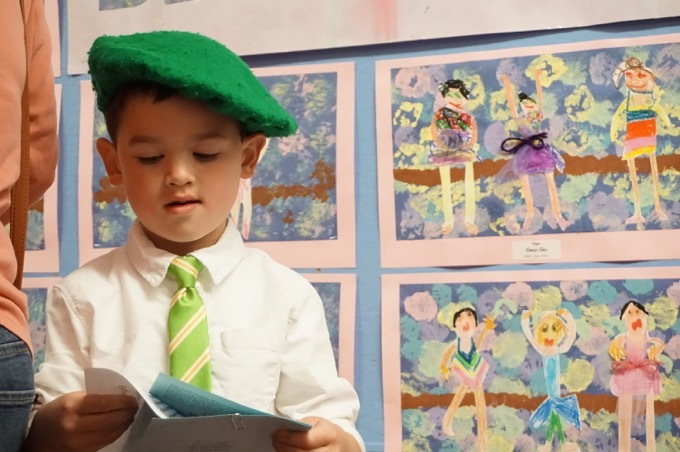 They weren’t awful, but the songs and dances were. Our attention was diverted, however, by the young man in the picture here who knew EVERY word to EVERY bad song. He seemed to be dancing along with them IN TIME and knew each and every upcoming move. In other words, we hid our son from him and high-tailed it to the food place. You read up some more while we eat. The first of three Cris Craft speedboats was purchased in May 1929, for $2,800. At a cost of 15 cents for a thrilling ride around the lake, it paid for itself by July. The 1930’s brought more growth. The Casino ballroom was expanded to include an enormous dance floor without walls, so that people could dance “under the stars.” Huge windowed walls and a high arched ceiling were added in 1937. On Easter Sunday, Glenn Gray and the Casa Loma Band opened the “Starlite Ballroom” to a full house of “big band” enthusiasts. Most big bands played Lake Compounce. From Dorsey to Calloway, Basie to Kenton, James to Goodman, the ballroom was packed for each performance. The all time attendance record of 5,000 dancers was set in spring, 1941, when Tommy Dorsey’s reorganized band featured a young, up and coming vocalist, Frank Sinatra. Lake Compounce prospered during the 1940’s and 50’s as a very special picnic/amusement park. Local entertainers also appeared as a weekly attraction on the Lake Front Stage and featured such talent as Tex Pavel, Colonel Clown and Slim Cox and the Cowboy Caravan. In 1957, the “Little Showboat” made its debut and took passengers on a leisurely “paddle” around the lake. In 1959, an 18-hole miniature golf course was added. In 1962, speedboats replaced the Cris Crafts. Their characteristic “rooster tails” doused riders and thrilled onlookers. We got some fries and when attempting to score some of that free soda (who in the world would pay for a larger size? ), we found that the soda machines were swarming with yellowjackets. One could argue that was the scariest and most thrilling aspect of the park. But one would be a jerk if one were to do that. We walked around some more and passed by several rides – some of which looked pretty cool. Check here for the rides I’m not describing. Also note that they qualify a trolley ride as “Thrilling.” That, my friends, is Lake Compounce in a nutshell. There is one wicked cool ride here – the old wooden coaster called Boulder Dash. I’ve ridden it tons of times before (my department at work went here for an outing and all I did all day was ride Boulder Dash) but that doesn’t matter. A great coaster is a great coaster. This venerable monster certainly satisfies; It is the first coaster in the world built on the side of a mountain. 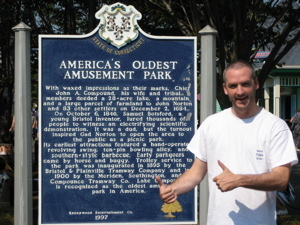 It was voted the # 1 wooden roller coaster in the country by the National Amusement Park Historical Association. It claims to be the longest and fastest wood coaster on the east coast. Whatever… it’s a great ride. At 4700 feet long (almost a mile), there are no loops or upside downs or special effects. But the fact that it goes through the woods is unique enough. It’s rough, of course, as all wooden coasters are, but that’s kind of the point. It feels out of control half the time and when the ride has only a few passengers, it seems to lift off the tracks at times. It’s actually ten times “scarier” than the other more modern coasters I’ve enjoyed. And it’s not just the ride itself that’s so scary – it’s a Killer Train. Yes, it’s true. 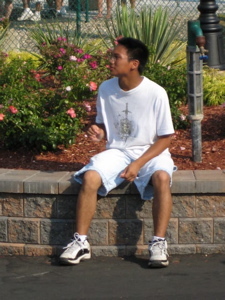 (Wednesday, June 13, 2001) – A 23-year-old maintenance worker was killed after a roller coaster train struck him at Lake Compounce amusement park in Bristol, Connecticut. 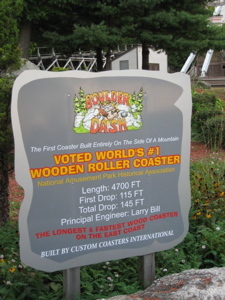 The accident happened on the park’s Boulder Dash roller coaster. The man was struck while the ride was being tested before opening, and no passengers were aboard. Good times. Want more? On July 1, 2000, a 6-year-old boy fell off his inner tube while riding the park’s Lake Plunge water slide. Lifeguards found him a half-hour later, curled up in a fetal position at the bottom of the lake, beyond the dock, 15 feet below the surface of the water. He never regained consciousness, and died one week later. Dang. Lake Compounce remained under the ownership of the Pierce and Norton Corporation until 1966, when Edward G. Pierce, Isaac’s grandson, sold his interests to the Norton family. The Nortons continued to own and operate the park through 1985. 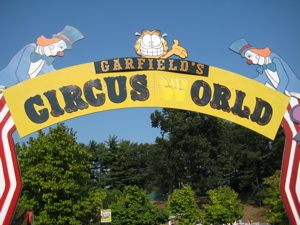 At that time, the family reluctantly sold the park to The Hershey Corporation, which renamed the venue as Hershey Lake Compounce. Following two years of operation and investing millions of dollars, a corporate decision was made to sell the park and return to its roots in Pennsylvania. 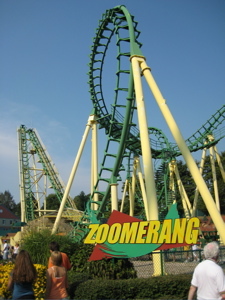 The Roller Coaster Years From 1986 through 1996, Lake Compounce experienced the “decade of the roller coaster.” Financial troubles and empty promises from a string of four owners severely tarnished the park’s image. During this decade, Lake Compounce had a checkered history including mountains of unpaid bills, a barrage of lawsuits and a string of unsuccessful turn around attempts. There was also a prevailing sentiment that time had passed the park by, leaving it behind in a simpler era of Tommy Dorsey concerts and 1950’s musicals. Steeped in tradition and filled with generations of summer memories, many amusement parks in New England suffered from neglect and then closed for good. 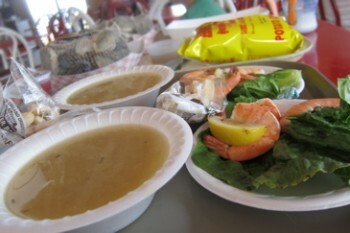 When Rhode Island’s Rocky Point, the nation’s second-oldest park, served its final clam cake and auctioned its rides in the mid 1990’s, it seemed to be one of the final nails in the coffin for the region’s moribund amusement park industry. Moreover, most small, family-owned parks had disappeared in recent years since they did not have the capital to continue operating. They have gone the same way as mom-and-pop grocery stores. *Sniff* After my succesful Boulder Dash ride, I found Hoang and Damian with chocolate ice cream remnants all over their faces. They had gone and eaten a giant ice cream cone while waiting for me – and had none left to share. We passed a few more rides and the Haunted House (which I have never seen but am certainly curious) on our way to the carousel. 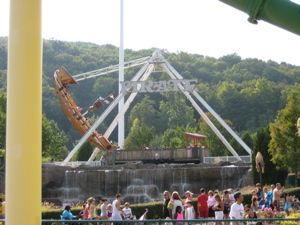 A New Beginning In April 1996, The Kennywood Entertainment Company, a family-owned company that operates three parks in western Pennsylvania, became the new managing partner of Lake Compounce. 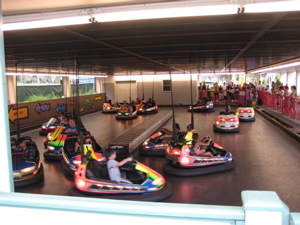 Traditional parks are a big part of Kennywood’s heritage. Kennywood Entertainment CEO Harry Henninger’s grandfather purchased Kennywood Amusement Park, just outside Pittsburgh, in 1906. What made the Lake Compounce opportunity tempting was the financial incentive offered by the state of Connecticut in the form of an $18 million loan. The agreement to partner with the state was predicated by a promise by the new owners to invest $17 million of their own resources. Back taxes of $1.5 million to the towns of Bristol and Southington were immediately paid off. Next, Kennywood recruited one of its veterans to serve as General Manager and tapped another industry veteran to oversee the marketing of the park. In the first year alone, more than $24 million was spent on more than 20 major new rides and attractions. The work of 50 contractors had to be orchestrated in the massive reconstruction of the park. Another key factor was to find the right balance between the older, more traditional aspects of the park with the new-age attractions that people now expect. 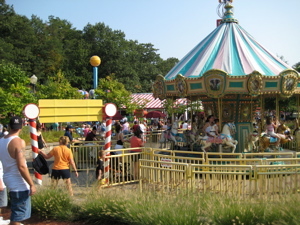 For example, a state-of-the-art roller coaster along with a white water raft ride and other thrill rides were added to the park’s line-up to complement the vintage 1927 roller coaster, the 1911 carousel, and an antique trolley. The Kennywood vision of what Lake Compounce could be, the company’s financial resources, and Kennywood’s knowledge of the industry coupled with the state’s involvement were the primary ingredients for success. Moreover, the image of the park began to improve when the company did what it said it would do. Since 1997, another $20 million has been spent to rejuvenate the park and restore its luster. In total, nearly $50 million has been invested in new rides, attractions, and physical improvements. So yeah, they’ve done a good job blending the classic and the new. The waterpark is great and the unique natural beauty of the spot make it a cool place. The kiddie stuff needs some serious updating and the cheese factor is still too high. But then again, this is Bristol, so what more can you expect? I love when Damian is in the pictures. No matter what else is going on he is always the center of attention. And rightfully so. In the last picture of him and Hoang it looks like Damian is clapping. YEA. I thought EdHill wrote the title. 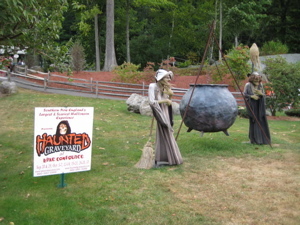 Steve – Great review, but you forgot one of the famous “deaths” at Lake Compounce. In July 1989, the infamous Milli Vanilli was outed there while singing the wildly popular “Girl you know it true” single. I never knew that but it’s totally true. In looking at the map, Lake Compounce falls in the miniture version of the Southwick Jog. Are Southington residents just as upset at Bristol as Conneticutians are upset with Southwick? I grew up in Middletown CT. We went to Lake Compounce every weekend !!!! I met a lot of great country music stars there, such as Loretta Lynn, George Morgan his daughter Lorrie, and many many more !!! This park was great during the 70’s. We personaly knew Mr. Norton and his sons. They use to have motorcycle shows in fact I do beleive I have pictures of some of the bikes that use to come there. The roller coaster was the best ever !!!! This review is ok, I will mention that Bristol is very suburban, not urban and there are alot of family-friendly activities in Bristol. Or maybe you don’t really know too much about Bristol and you belived what the small group of obsessive, ghetto-wannabe minorities have told you. I was there in 1981 for a family outing which we did every year since the 70’s.. A girl was killed on the Roller coaster. I have never gone back. It creeped me out.